It was the summer of 2002 and I was working at Borders. I remember shelving the small books and being instantly intrigued by the minimal yellow cover. It was so cute. And the title was very…me. I had always felt like a wallflower. So I bought it and brought it home and read it. And read it again. And again. And again. It was the summer after my freshman year of college and while I was four years older than the protagonist, I knew how he felt. It was just so real. So I started reading it every year. Now, there are two types of book owners I’ve realized: a) those who believe books are a work of art and prefer to keep them as pristine as possible and b) those who believe the more worn a book looks, the more loved it is. I subscribe to the second belief. My books are very loved. In the process of handing it off so often, my copy started to wear down. Pages were lose, ripped. And then, one day, a friend spilled an oil candle on it. At first, I was upset; my book was ruined, gone, dead. But then, when the pages dried, I saw that there wasn’t any harm, really, and the only permanent damage was that it kind of smelled like cinnamon apple. Because every time I went into a Cracker Barrel I thought of Perks. Every time I went into one of those country, good-time shops, I thought of Perks. And I smiled. Years later I taught high school english. On my first day, as a very scared 22 year old, I passed around surveys to my students to learn a bit more about them. Who was an athlete, who was a drama kid. The last question asked them what their favorite book was. It wasn’t a Bill and Charlie moment; we didn’t become best friends or anything like that, but I was so happy to see that the book transcended generations. That the same book that spoke to me so many years prior still applied to teenagers today. Which was when I realized that I could relate to these students. While I didn’t have a cell phone at their age, I did understand what it was like to be a wallflower. And I think that’s the most important part of the book. It makes you feel understood, and connected to a larger group of people you might not have known otherwise. Good books can do that. And this one certainly did. 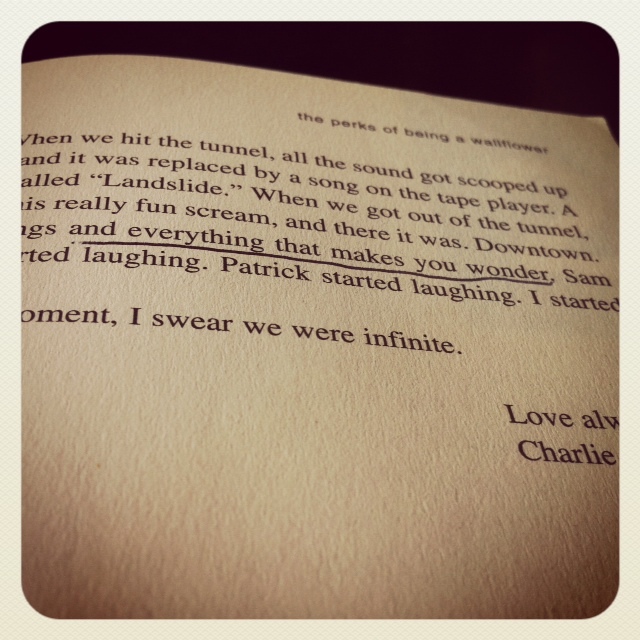 Have you read The Perks of Being a Wallflower? What’s your story? What’s your favorite line? She since got a tattoo of the infinite quote. There’s something about Perks that garners that kind of love. It’s crazy, isn’t it? It really is fascinating how so many people make this book their own. I’ve been going back & forth trying to decide if I should read this book. You’ve convinced me! And I’m the second type of book owner too. Love it when they’re worn in! Haha. yep. I got what you mean. a star wars fan here as well. I’ve never read the book, but I think I need to finally do it! And I feel the same way that you do about books. I like them to look read. Granted, I have some that I like to keep in pristine condition but for the most part, I want people to be able to look at my bookshelves and instantly know what my favorites are. That’s why I was so hesitant to get on board with e-readers–how could I underline and dogear with an e-reader?! Read it! And then let me know what you think. 🙂 Also, there are books I like to keep in perfect condition too. The fancy ones, the older ones. Those I keep nice. And while I get e-readers, and see why people love them…I’m like you. I like underlining and dog-earing and seeing my books on a shelf. I like holding them. I read the book three months ago, and as I read it I found so many memorable quotes, like you. Since it was an already worn-out library book, I would dog-ear the pages with interesting quotes on them (like the previous commenter). After I had to return the book, I got a copy of my own. With this copy, I was kind of like the ‘first type’ of book owner you mentioned… after a few months, it still looks perfect and brand new because I can’t bear to do anything to it. I’ve read it about three times since, and every time I read it I figure out something new. It’s the kind of book that, no matter what kind of person you are, you can relate to in some way. There are so many different characters with different personalities, but they all seem to fit together well for the story. It’s really a great book. Thanks for sharing! Yes! Every time I’ve read it, I’ve found something new. And I love that about the book – about any book, really, that offers new views from repeated readings. It’s really great.